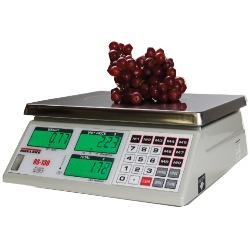 The RS-130 retail price computing scale is a very nice digital scale for a candy shop or produce stand. The scale is great for an outdoor farmers market since the RS130 can also calculate change. The RS-130 retail scale offers practical solutions for a full range of point-of-sale weighing and price computing applications. It is also one of only a handful of legal for trade retail price computing scales that uses the ounces unit of measure. Its compact design makes it easy to transport and the customer display on the rear of the RS-130 offers extra convenience. The battery has 100+ hours of use before it needs recharging. When the battery is low, the TOTAL $ display shows -LO- and there is a continuous beep. Press the CLEAR key to remove -LO- and end the beep. After the initial warning of low battery, the scale has aproximately two to three hours of battery life left. Allow eight to ten hours to fully charge. 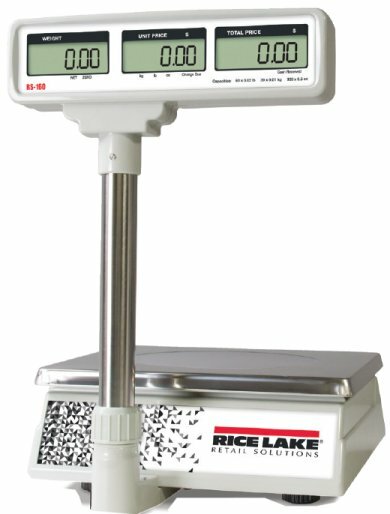 Very few retail price computing scales on the market can boast of having all the features of the Rice Lake RS-130 digital price computing scale. This RS130 retail scale is of course NTEP legal for trade. But what sets this scale apart is the fact that it displays weight in pounds. It displays weight in kilograms. Finally, it displays weight in ounces. By the way, did we mention it also can calculate customer change? The RS-130 from Rice Lake packs a powerful punch and is ideal for a farmer’s market stand, chocolate shoppe or produce stand. 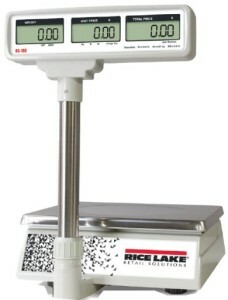 The scale can operate on standard AC power or the built in rechargeable battery.